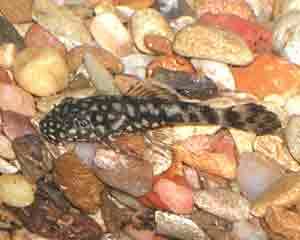 My son’s plecostomus spawned some time ago, mid 2008. Heh heh – “spawn” (not of flame, however). We moved a few of the babies (well, they weren’t babies anymore) into my tank last fall. Those babies have now produced a new batch of babies. They must have been there a while – they are about 1 / 2 inch long already. There are at least 2 albino ones; here they are posing just so that I could take a baby picture! That picture makes them look so BIG! In the category of things living in our house, we have three Yellow Labs, but they are not the kind that you might immediately imagine. 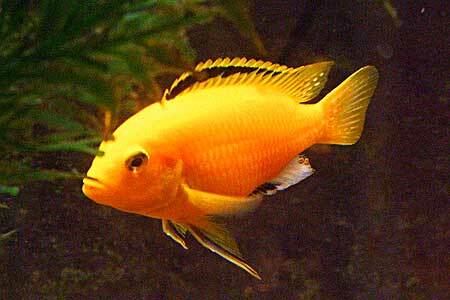 They are fish – Electric Yellow Lab – Labidochromis caeruleus. These are African Cichlids from Lake Malawi. As far as these kind of fish go, they are on the low end of the aggressive meter, but they still inhabit their own tank. They are currently about 3.5 to 4 inches long. I believe that this one is a male, I can’t get a picture of the female because she is always hiding. 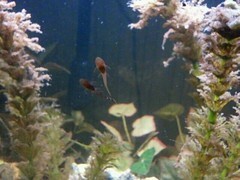 My second post on this blog was about some baby plecostomuses that had come to live at our home. When I bought them, I had asked the breeder what tiny plecos would like to eat. He told me a few things, and one of them was that a piece of driftwood was good for them to nibble and to just hang out on. We did not want to put just any chunk of wood into our tank, so this gave us an excuse to trot over to one of our favorite local pet stores, Two Turtles. There, they had a stunning array of driftwood. Each of the driftwood selections were attached to a piece of slate and we inquired about its purpose. The sales guy told us that it was to help anchor the wood to the bottom of the tank and that we might need to add even more weight to keep it down. His parting words to us were “good luck”. See, we had pictured the driftwood nestling gently on the bottom of the tank and maybe tilting a little requiring a small adjustment now and again. Wrong. wrong. wrong. We couldn’t even get it all the way into the tank, it was so bouyant. Definitely not expected. On the bright side, part of it was in the tank, and the plecos cheerfully did indeed nibble at it and in general hung out on it. So, now we have this driftwood a little into the tank, a lot of driftwood sticking out of the tank, and the lid of the tank hanging open. Ok, at least there are no jumpers in the tank right now. So, we had to revise our expectations of the behavior of the driftwood. Maybe it will get waterlogged and sink in a couple of days. Then we can place it in a tasteful location of the tank. Time passed. The driftwood barely budged. That was unexpected. Finally after a couple of weeks, it did take on enough water to sink enough so that the lid of the tank would once again close. Victory! 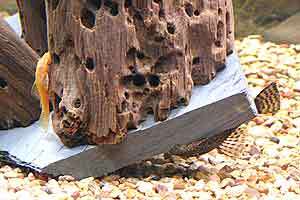 Of course the plecos did not care where the driftwood was and continued to blissfully nibble away at the wood. Fast forward, now two months have passed. The driftwood has finally touched the bottom of the tank. I am now really beginning to understand the “good luck” admonition from the pet store guy! In my household, other than people, we have a dog, a cat, and fish. Many, many fish. Numerous large tanks. You get the idea. Among the fish that usually inhabit our tanks are plecostomus. These are algae eaters and otherwise cleaner-uppers, and can grow relatively large – easily a foot long or more in a good sized tank. They also can live a long time – our oldest, John, left our worldly waters a few years ago at the ripe old age of 22 years. John, incidentally, was named late in his life, and was bestowed his name in honor of my son-in-law. I’m not sure that John, the son-in-law, realized what an honor it really was to have this fish named after him. A few years ago, we had a bristlenose plecostomus. These fish don’t get as large as the “regular” pleco, maybe 4 or 5 inches at most. They also get these bristly protrusions on their noses, hence their name (stating the obvious). She (I think – because her bristles were not large) is also no longer with us, and I had not adopted any new ones, until now. 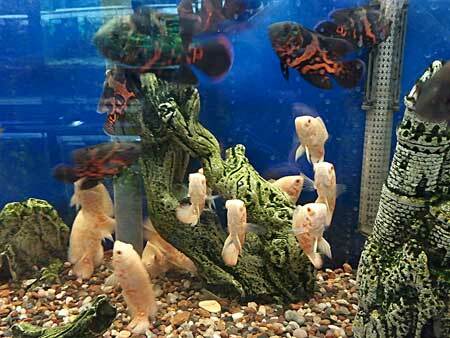 I bought a DOZEN babies of these fish on AquaBid last week. They arrived, quite vigorous and healthy, and have been happily scraping the glass in my tank for the last few days. They are so sweet – the smallest is a little less than an inch long. I am looking forward to them growing up in our tanks. In addition to raising fish, I make artisan lampwork beads in my home studio. See my website www.SpawnOfFlame.com.